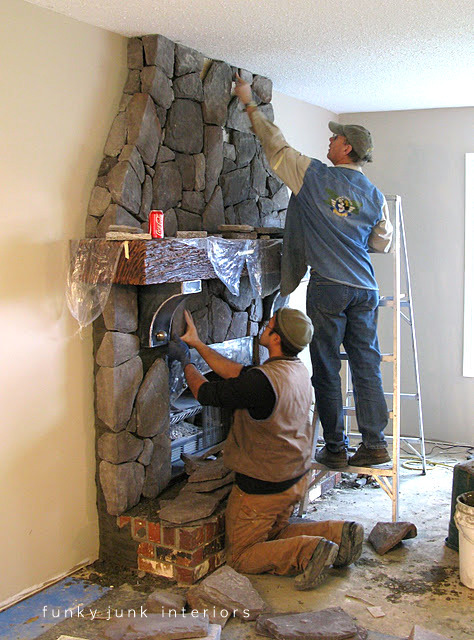 Creating an old world cultured stone fireplace, without massive destruction is possible. Here’s proof! asked me what plans I had for the fireplace. I cringed, wishing I HAD plans. He jumped in and offered to help create something I could feel really proud of. That was a very good day. 🙂 So together, we came up with some designs and a plan of action. First, the mantel was created out of high density foam board that was hand carved, hand tooled as well as run on a CNC router to create the whimsical woodgrain. It is HUGE and very heavy. After the carving of the mantle, came the many layers of paint and glazes to recreate deep rich woodsy tones. … and the new one is installed. Also added at this time were metal corbels hiding the original brick ones, as well as a decorative metal insert. A framework was created in order to carry the fireplace right up to the ceiling. Note the curvy sides, for an old world appearance. The upper framework is attached. Next, a skim coat of cement (and other things) covered the existing brick to create the base for the rock work. Buddy Dan and the overly talented crew carefully trimmed and placed cultured stone on the framework and existing brick interface. Here Phoenix is applying an acid stain to his hand carved fiberglass reinforced concrete base. A solid looking rock was hand sculpted over top of the brick rather than using cultured stone, in order to create more visual weight to the base, as well as a comfier place to sit. The final result? Old world charm that demands your full attention when you walk upstairs. I’ve always loved fireplaces that touched the ceiling. I love how they move your eye up wards, creating a much grander presence. Here’s a closeup of the massive metal corbels that were created to cover over top of the existing brick ones. And their massiveness also brought the over sized hand carved mantel into proper scale too. Isn’t this an amazing touch? One can paint the metal or even apply acid to rust it, however I fell in love with it just the way it was. (which ties in with my kitchen island). This metal plate was created to visually remove the plain square hole. I had actually desired the rock to capture the soft curves of the top, however this plate was a great fix. It’s held in place with pins that can simply be removed if one wishes to change to a gas insert at a later date. 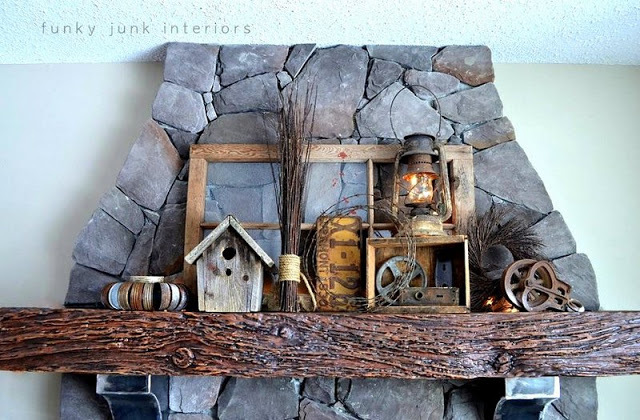 The faux wooden mantel itself wears many layers of paint and glaze, creating rich wood tones that capture every nook and cranny of the added texture from all the tooling. Because the mantel is over scaled in size, you really have the opportunity to pile on the accessories! It’s very fun to create different looks! OMGoodness, this is just amazing! It’s all beautiful. I especially love your mantel! Although, we just tiled our fireplace, I took it down this week. It looked way TOO traditional with the mantle. I’d like to have something more contemporary/modern to contrast the traditional lines of the mantle. I love the look of the old cast iron fireplace surrounds. I included my link. Do you mind dropping by and give me your opinion. Thanks! Wowzers!! What an awesome fireplace and mantel!! Love the carved wood…and the stone and metal really make this pop!! I need to do something with mine. I am still thinking about it. This is an amazing transformation. I’m really impressed and jealous. I don’t have a pic of my boring fireplace. I’ll have to get one to you. It’s really horrible. It’s long sandstone bricks with a tiny, almost non existent mantel. I think just adding a larger mantel would make a difference. Unfortunately I don’t think my husband would go for a huge expense in this area right now. He doesn’t get it! Thanks for sharing your project. Love the transformation. I just want mine hooked up for now. My husband surprised me with a small one. It is sitting in place but not hooked up. Hey, don’t rush him it’s only been 5 years! I just love your fireplace, it is beautiful! What a great transformation! LOVE,LOVE,LOVE! OMW is that beautiful! WOW! What a transformation! I know that you love it. When we lived in Georgia, we had a really ugly brick fireplace and I painted it white. It turned out beautiful. We just moved into a new house and we have a double mantel. I am going to paint it a glossy black. I think it will really pop. I am so very glad that you reposted because I missed this one the first time around. A.M.A.Z.I.N.G! Would you mind if I feature you in my review? And one more question for you: Where can I get a buddy Dan? I need one. 🙂 Thanks for linking up! Darn I wish I would have known about blogging sooner. My husband and I have updated 2 fireplaces. The first one, we built from the ground up, gas vented, in a corner and covered with stones and slab stone for sitting on, we just loved it. Our second house, we had the builder put up some framework, during construction, but we ended up doing more framework ourselves. We made it look “european” by skim coating and roughing up surface, then painting, blotting, and glazing for right effect. I will have to see if we have any pics. You know, you never think of taking pics, when in a creative mood. Thanks for sharing and inspiring us with all of your ideas. I wouldn’t want to move from that room! I’m going to show my dad the pictures! He built one of our homes (when I was just 6) that we lived in and we had a massive fp that he did himself with rocks! I agree, nothing like crackling sounds! I sincerely hope that if not today, someday, you get paid for all your effort here!!! It’s so time consuming to be connected and you are so giving, capital G, with your knowledge, pictures, words, creations! Hey, I have 10 followers!!! Hilarious! I’m gonna have a giveaway!!! You know? – to celebrate! I need a Dan too! My fireplace is this ugly, 1970 brick thing – way worse than yours was. But for some strange reason my husband likes it. We did put a gas insert into it a couple of years ago and although I miss the smell and crackle of the wood, I love the ease of flicking a switch. Your transformation is fantastic – I envy it every time I see it. Your fireplace before wasn’t all that bad, but the after is killer. I love that beefy mantle. Where did you find the material for that? And did you say the metal corbels were hand-crafted? I would love to replicate this look! It’s gorgeous. 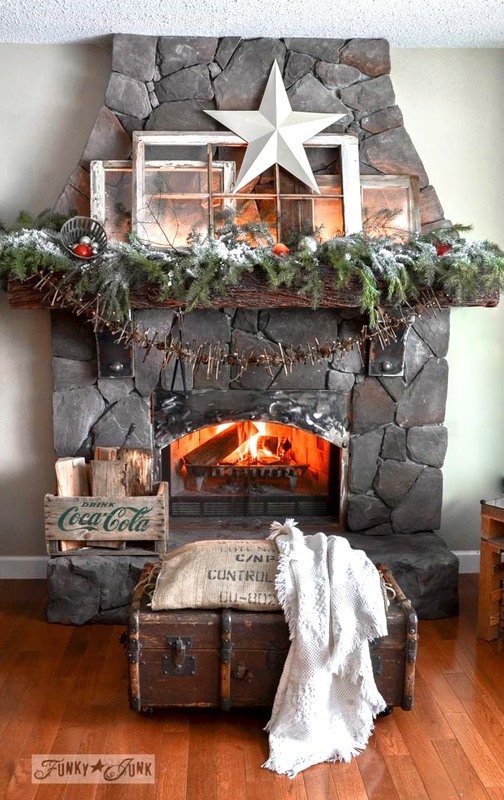 I love what you did with your fireplace! I have BIG plans for ours … it is really just drywall that goes up to the ceiling. I want to make it wider and cover it with stone veneer or paint it to look like stone. This project will be a long while before I tackle it but I have it pictured in my head. Alot less destruction in mine. I just had to jazz up what was existing and am pretty happy with the result… Going from NO mantel to this one made me happy. We didn’t have a mantel at all– it was a very small area, and we totally wanted it to be a DIY project. And here it is! This is so awesome and you are so brave. A huge project but so worth it. Wow, it is gorgeous and I would love to know about that sewing machine up there ! 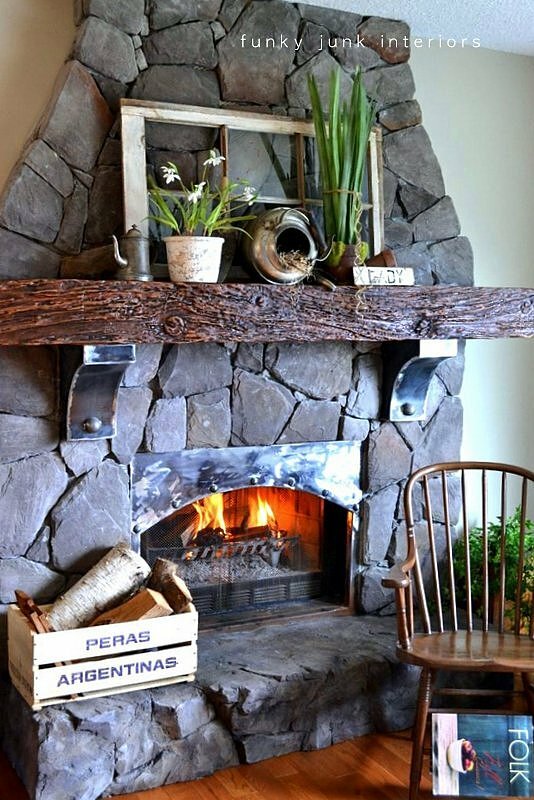 Pardon the pun but… Your Fireplace Rocks! Can you tell me where you get “high density foam board” and what it is normally used for? I’ve always thought your fireplace was amazing! My mantle is way to narrow (in depth) so I can’t layer anything on it. Instead everything has to line up, which looks really stupid. I am cooking up some plans to make a bigger mantle to put on top. We’ll see if I ever get around to it! I’d love to know where you found the corbels. I wanted some for a shelf project, but haven’t been able to find any that I like. And if yours mysteriously come up missing, I know nothing about it. #9. Beth, buddy Dans are very hard to find. You have to be in the right place at the right time. 🙂 But I have now linked him up to his website, so maybe if you move out my way… And hey, I’d be honored to be featured! #13 Cassie and #21 Julie, I’ve updated my main post and linked a website to the words ‘high density foam board.’ A sign shop that hand carves or has a router on site are the places that would have these types of materials. They come in different densities too. The higher the density, the smoother and heavier the material. Dan only uses the best at 30 lb. What an awesome remake! Great job! Lovely! You have made lots of stone and cold metal warm and inviting, and I am in awe! All I have to say is “beautiful”. Thanks for sharing it with us. I am thinking of attempting an old world effect on our surround this weekend. I have the supplies just not the guts yet. 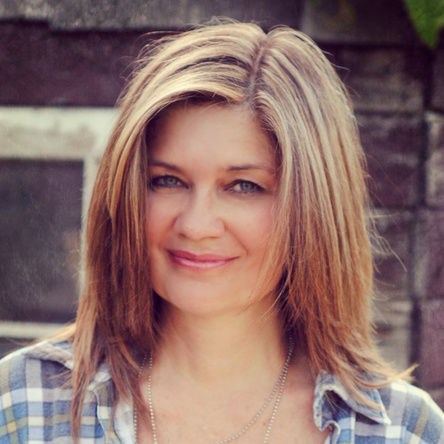 Love your redo! Holy cow that is amazing! I can’t believe that your mantle isn’t real wood, it’s so realistic looking! And I love your metal corbels. Truly an amazing transformation!! It looks fabulous! Love the redo! What a wonderful transformation! I love it!!! It must be fun to decorate too. Just beautiful! I love how you carried the stone all the way up the wall. Fabulous and amazing!!!!! Wow Donna, great ideas and I just love how it looks now, great job!!! Fabulous makeover!!! I’m in love!!! I so need to do something to my fireplace. But lack of funds is having me live with what I have. I wish I could be an “out of the box” thinker like you. I love it! Great transformation. 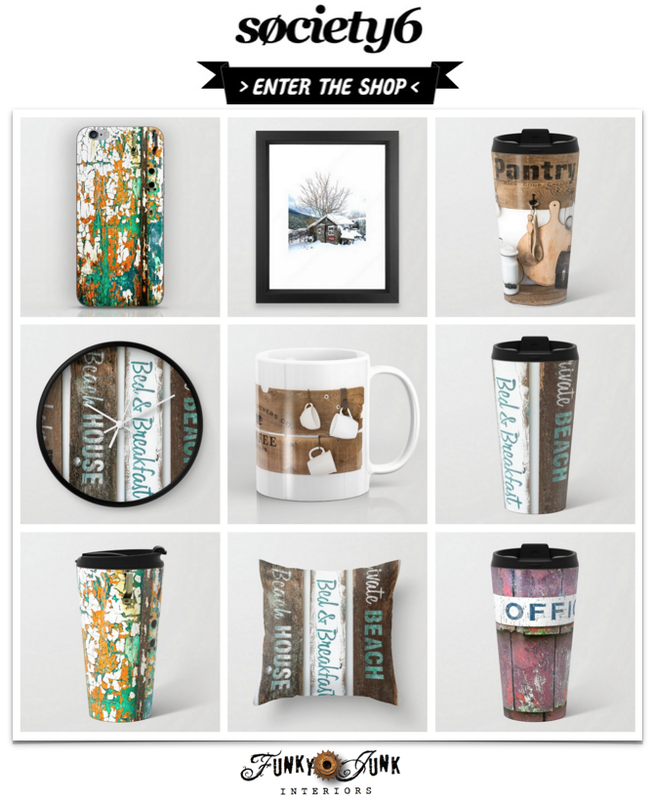 I am especially fond of the one with the window frame, rooster print, and the crocks. I have a wood mantel, and have been trying to get up the nerve to carve our initials in it like an old tree might have been carved. All I can say is JEALOUS! I just love how you worked with what you had and made it better through creatively using materials. It looks soooo much better and is such a statement in your room. I also love all of your mantle arrangements. All I can say is- Can I have Dan? 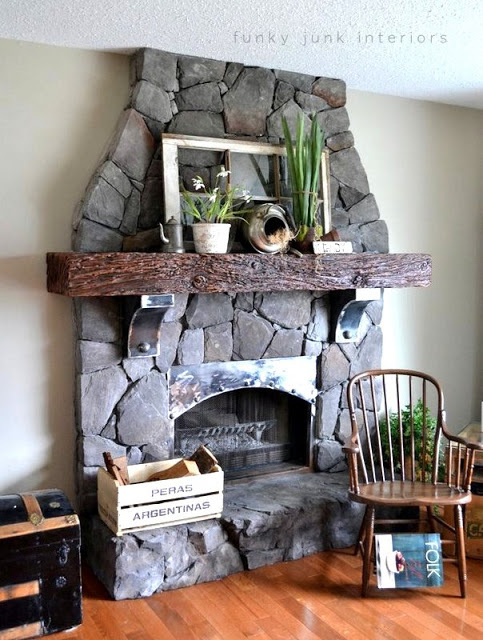 OMG, it’s the absolute best fireplace overhaul I have ever seen! WOW! I Love the metal corbels. Can you give me any info on these beauties. We are getting ready to put up our mantel and have been looking at options. Our fireplace is floor to ceiling and crafted from stones salvaged from an abandoned farmhouse in our area. We have a pressed tin ceiling in that room and the metal corbels would look perfect. Any info about how they were made or who made them would be greatly appreciated. Thanks!! Fantastic!! What a transformation! I just love the old world look of it and how impressive it looks going up to the ceiling. 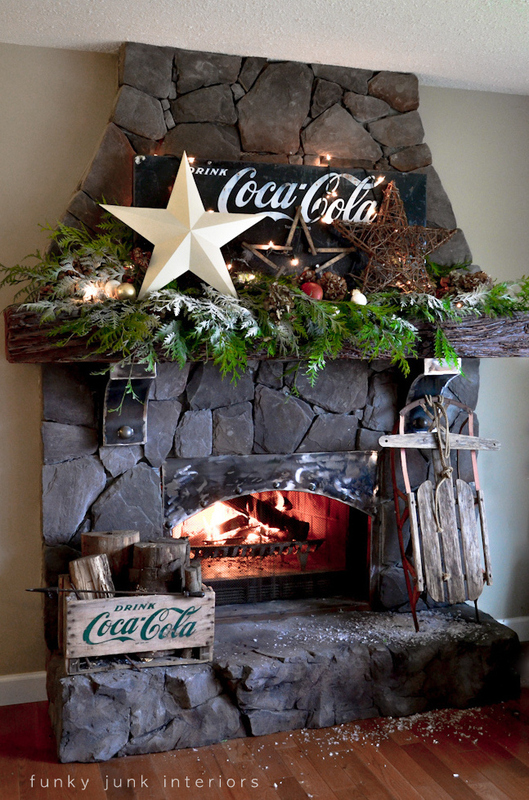 Your seasonal decorations on the mantel are fabulous too! That’s really beautiful, Donna! It does make me think of a European chalet. WOW! That is neat to see how it was all built. I especially like the metal corbels. Now you said that you use acid to rust metal? How does that all work, and what kind of acid? That is so freakin’ amazing! It reminds me a little of Hansel & Gretel’s house. It’s so cozy cottage storybook like. I LOVE IT! That’s an amazing difference. I love all of the opportunities to change it up. In the picture where Cody is sitting in the chair in front of it, do you have a full on of what’s on the mantle during that time? It looks all grape vined up and I’d love to see that. This is absolutely Fantastic..what a transformation. Covering the corbels with metal was genius and adding the piece above the fireplace makes all the difference. I am totally impressed. That fireplace of yours is AMAZING. WOW!!! that is a CRAZY transformation!!! i just love the end result!! your home is such a beautiful, cozy, welcoming retreat. That is FANTABULOSO!! It looks awesome. Your Christmas mantel took my breath away. It’s SO pretty! Nothing beats a “real wood” burning fireplace! My parents have one, and it is my favorite place to be. I love the rustic feel of your renovation, it’s just beautiful! whaaaat!?!?? that is TOO AWESOME. wow. seriously impressive!!! Oh my this is awesome!! You did an amazing job! 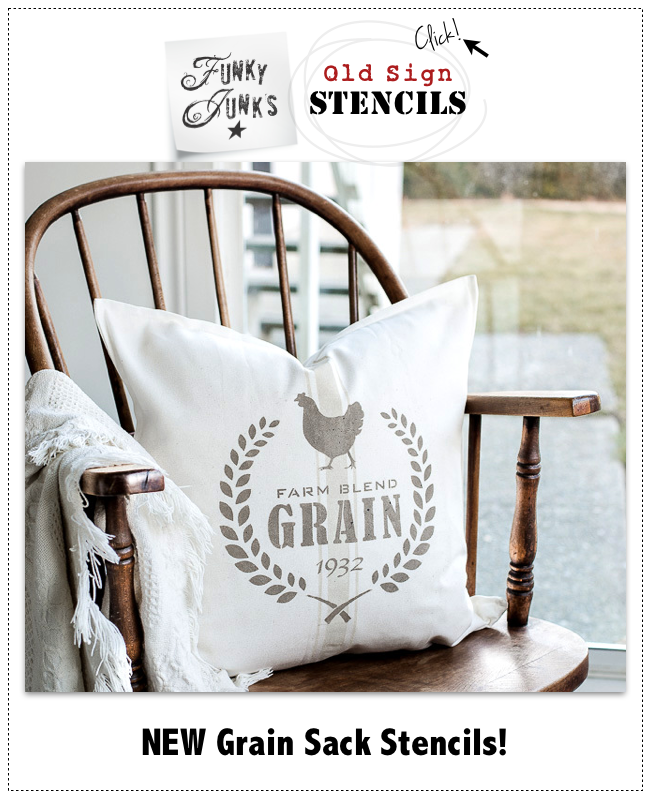 That is Fantastic!~ I love the rustic charm! Wow! What a rustic, fun change! Good job. What a great job! I dislike plain builder graded white washed surrounds and most brick surrounds so I really enjoyed reading and seeing the transformation and how you have dressed it. I wish I had the creativity! Instead I ripped out the old brick fireplaces in my new house and replaced these with Limestone Fireplace Surrounds. Anything but brick! An amazing transformation from bla.a.a. to stoneragious!! I like the different mantal displays too…especially the star and white blubs…mixed with a wood branch…that gives me an idea for next year’s mantal at my cabin! being a contractor myself, i’m especially impressed with the collaboration on your project! my favorite projects are always the ones that the owner gets really involved! What is your entertainment center made of? Although the end result isn’t my style, it’s awesome watching it take shape through all the photos. That is incredible!!! I just figured you lived in an old house that came with a spectacular fireplace and mantle! Truly an amazing project…. I live in a mid-60’s tract house in Texas with the faulted ceiling and faux beams. Would love to do something to my fireplace too. Hmmmmm…..I’m inspired!!! Had to stop and feed the pups, now I don’t remember how I got to this post! Very cool watching the fireplace transformation. If I hadn’t seen it, I would never ever guess that your mantel wasn’t solid wood. You all really worked together well and knew what you were doing. Bet Mother Nature would give you an A+ 🙂 Even in the close up pictures it looks like the read deal. Great job! Wow! It is beautiful! 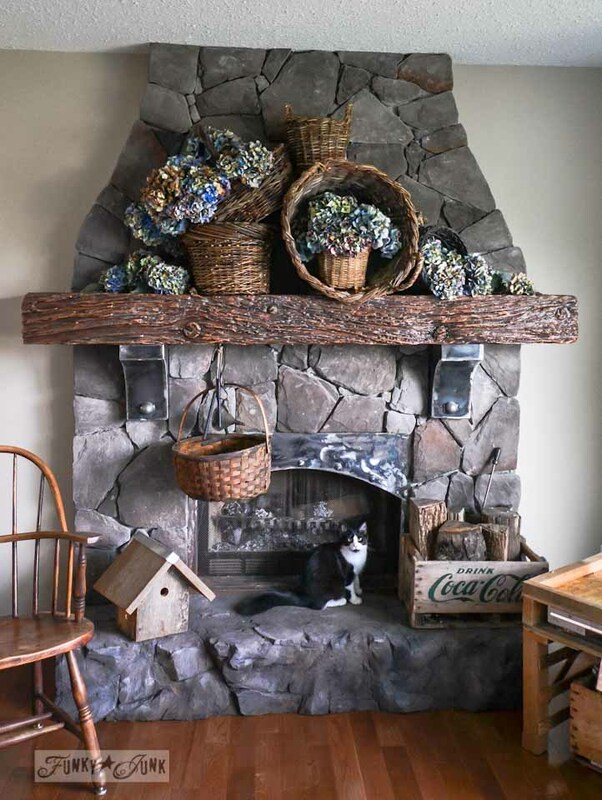 I love the stone fireplace, it looks like it has been there forever! And to see it decorated for all seasons was really fun too! I simply love all of the differing decoration and two faces of the fireplace. Great designs. I’m amazed at how beautiful is that!. I wonder how did you manage the rocks to keep the perfect shape on the upper curvy sides. A girl can dream though! 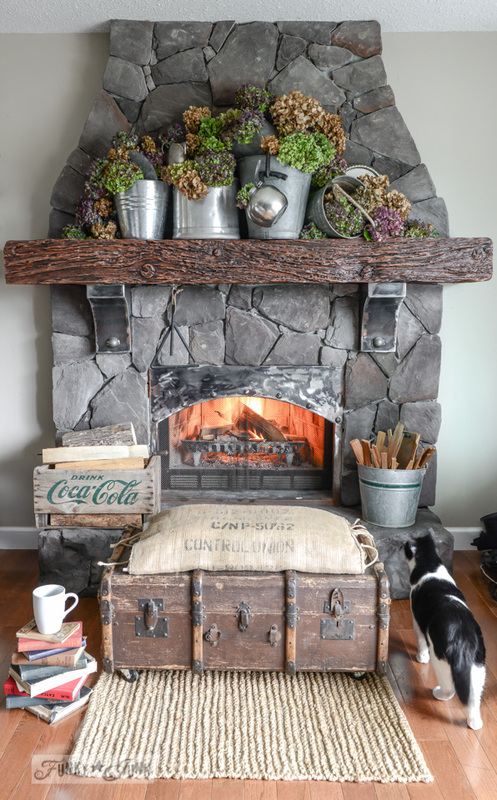 Donna, I’d never seen this page before on how your fireplace came to be until today when reading your post on how your metal garden orb came to be. I clicked and clicked and suddenly was here! I’d seen your spring mantel box (created after the demise of the barrel) and noticed your beautiful mantel shelf. It looks almost exactly like a length of an old rustic barn beam I’d spied at a shop in St. Jacob’s, Ontario which I had promptly fallen in love with. Perhaps I need it even more than I thought…now that I’ve come up with some uses for it. ?